Parents are outraged over a limited edition Kinder Egg toy which they have deemed “racist.” What shocked these overly-sensitive parents? 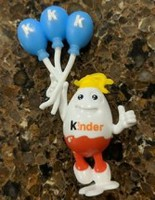 A plastic cartoon egg holding three balloons with a “K” for “Kinder” stamped on each. Horrors! Surely every toddler who saw the toy will be scarred for life! Kimberley of Victoria Australia, declared she was “sickened” at the thought of her 15-month-old son playing with such a thing. “This is a massive oversight that anyone could have seen,” she posted on parenting website Kidspot. “It’s also hard to find something to say as the initials of Kinder Surprise aren’t KKK. It raises questions as to what the company supports and if this is subliminal marketing,” she continued. Ferrero did not offer to provide counseling for those infants and toddlers who saw and played with the horrifying “KKK” toy once they are old enough to understand what they saw, or for their parents who suffered the trauma of seeing their children playing with the offensive toy. Sources: Fox News and The Sun. People have gotten so unbelievably crazy. Why would a mother in Australia -- where the KKK never existed -- be "sickened"? What will she do if her kid ever sees someone whose initials are KKK on their beach bag or luggage for identification? Parents who get upset over a kid's toy have too much time on their hands. If anyone sees any of these for sale on Ebay or some other site, PLEASE let me know. I want some to pass out at Mardi Gras.